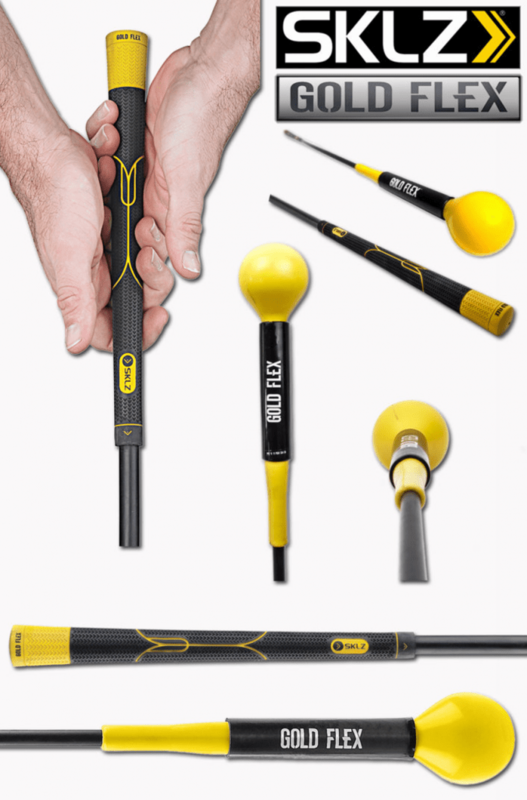 SKLZ Golf Flex Golf Trainer Review- Best Swing Tempo Trainer Ever? 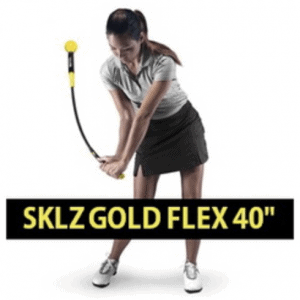 My suggestion is that you grab the SKLZ Gold Flex golf trainer and start learning to have a smooth transition and to initiate your downswing with your hips- not your arms and hands. There’s no quicker way to warm up pre-round or before you are settling into some practice at the range. Because of its design and the 2.5 lb weighted end- you will work all the proper golf muscles and be forced to swing in the proper sequence. It’s available in 40″ and 48″ lengths, so it’s suitable for men and women, as well as people of all builds. 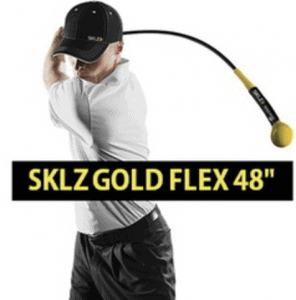 The SKLZ Gold Flex functions both as a golf-specific training aid and a golf-specific physical fitness aid. The transition from backswing to downswing is where the Gold Flex shine- teaching the golfer to gather speed and acceleration with a patient approach. SKLZ accomplishes this with the flexible shaft and the weighted ball at the end. Once your hands reach the top of your backswing, the weighted ball continues- forcing you to pause and “gather” power and speed. Any attempt to swing from the top with your upper body is met with disaster. Instead- you must wait until the proper moment to begin the downswing, and you must also initiate the downswing with the hips, and then the arms. Proper sequencing helps you release effortless power into and through the ball. What really impressed me about the Gold Flex was the violent whip or acceleration through the ball to a nice full finish that it had. As I continued swinging the Gold Flex, I realized that, as good a ball striker as I thought I was, I had gotten lazy and actually begun hitting at the ball as opposed to through it. The Gold Flex “coached me” back into a full throttle acceleration through the hitting area while stretching and building my core muscles. I actually began to tire after about thirty or so full back-to-back swing signaling that I needed to work on this more – rebuilding my hand and core muscles. Top customer reviews comment on the fact that the Gold Flex helps you achieve a smooth and full finish as a feature that they didn’t expect and are very impressed by. You can take the Gold Flex on the course, but it must remain in the bag and can only be used pre-round. The good thing, is that by swinging the Gold Flex 20 or 30 times pre-round you will be able to carry that feel and tempo onto the course with you. It’s just as the Gold Flex was designed. Muscle memory is sped up by its design. We find the SKLZ compares favorably to the Orange Whip- especially when you consider that it is priced about 40% Less.